A case of ulcerated, classic Kaposi Sarcoma (KS) of the foot is described. This is a tumor of vascular endothelial origin which most commonly present in men 50-70 years of age. This case report includes presentation and discussion of differential diagnosis, surgical removal, histopathology interpretation, incidence of metastasis and treatment. Classic KS was first described as most prevalent in elderly Jewish, Mediterranean men between the ages of 50-70 years. [1,3] The ratio of KS in men to women is 15:1. The highest incidence of KS is reported in Sicily. In the lower extremity, the lesion is most commonly associated with venous stasis and lymphedema. However, lesions on the plantar surface of the foot are rarely associated with edema which complicates this classic description. The lesions are usually violasceous, red to pink in color. 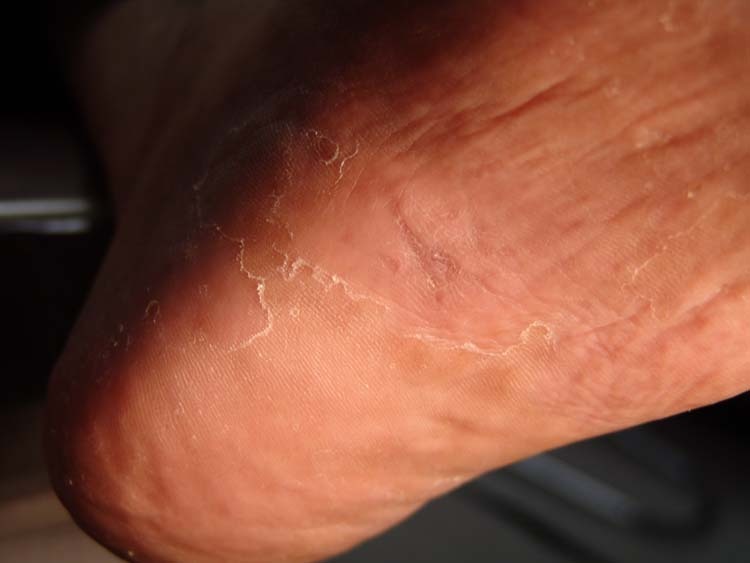 Almost all cutaneous lesions are raised, non-pruritic and symmetrical. The histopathology of KS reveals excessive spindle-cell proliferation throughout the endothelium. Human Herpes Virus 8 (HHV-8) has been identified in over 90% of all KS tumors, suggesting a causative role. The incidence of KS of the foot is rarely reported. 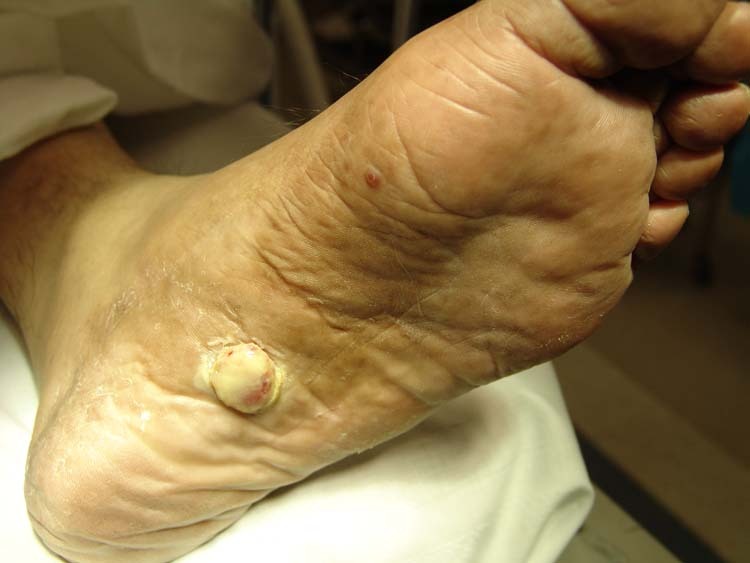 This report describes a case of ulcerated, classic Kaposi’s sarcoma of the foot is described. Figures 1abc The Kaposi’s tumor measuring 30mm in diameter. This circular soft tissue tumor of endothelial origin is macerated from occlusive dressings placed over the lesion. 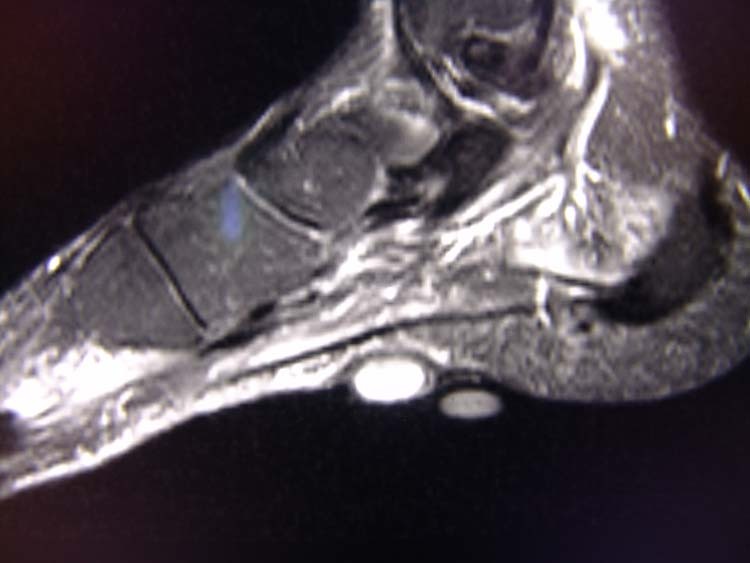 A smaller lesion is noted along the plantar, medial border of the foot along the first MPJ. The patient and family report he has had this lesion for a number of years. It recently became more macerated with ‘bleeding’ due to its size and location on the bottom of the foot. The patient has no history of allergies. His medications include Gabapentin, Metformin, Trental, Glipizide, Metaprolol and Lisinopril. He has type 2 diabetes, hypertension and has undergone previous vein stripping. His physical examination reveals a well nourished male with palpable pulses. Minimal edema was noted to his extremities with some pretibial pitting edema. The patient has been covering the growth with a large, occlusive bandage that caused significant maceration of the lesion. The patient also had a smaller lesion along the medial distal foot. The patient had the lesion on the bottom of the foot for over two years without discomfort. The lesion is macerated and vascular in appearance, pedunculated and attached to a ‘stalk’. (Fig. 2) MRI of the foot revealed a cutaneous soft tissue growth not extending into subcutaneous fat. (Fig. 3) The patient was taken to surgery to remove both lesions by simple excision. Figure 2 The tumor is attached to a stalk or pedicle. 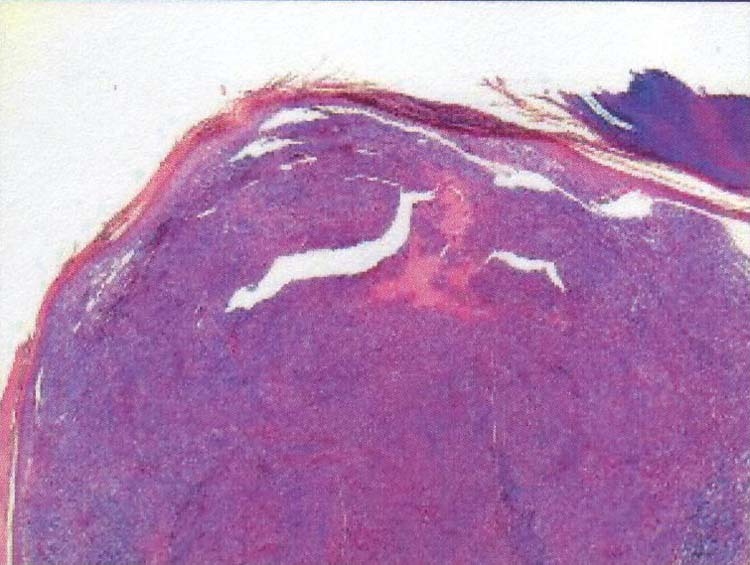 Figure 3 The pedunculated tumor is located in the acral skin with nodular proliferation of the dermis. The patient was brought to the operating room and under local, IV sedation, the lesions were elipsed and removed. Simple horizontal mattress sutures were used to close the excision sites. A simple dressing was dispensed and the region healed without complication. To date, there has been no recurrence of the tumors. The histological characteristic of KS does not vary between the different clinical types, but the progressive nature of the tumor varies. Early lesions show spindle cell proliferation within the interstitium of the upper dermis close to the vascular plexus. Nodular lesions are characteristic of older and more progressive tumors. 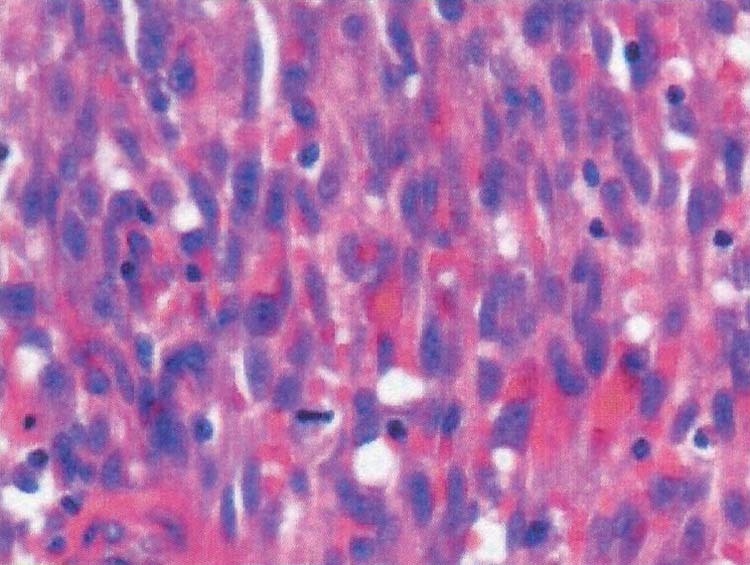 Figure 4 Under simple H&E (Hematoxylin–eosin) stain, magnification x 20. Lesional cells stained positive with CD31 and focally with CD34. Figure 5 High power view of lesional cells. Note extravasation of red blood cells in slit-like spaces, magnification x 400. Slit-like vascular spaces containing erythrocytes are typical of the histologic characteristics of KS. These split-like spaces with extravasation sporadically display features of lymphangioma. Immunoperoxidase stains consisting of HHV-8 and S-100 were performed at the Baylor College of Medicine reference laboratory. This report confirms atypical spindle cells demonstrating nuclear positivity for HHV-8 and negative for S-100. This renders the final diagnosis as ulcerative Kaposi’s sarcoma. Figure 6 A few weeks after excision of tumor. Inspection of the patients mucous membranes revealed no other suspected, discolored or violasceous plaques. We have recommended the patient undergo routine colonoscopy to rule out any visceral involvement. 1. American Cancer Society: What is Kaposi Sarcoma, [online], 2008. 2. Fishman, A., Sparano, D.: Kaposi Sarcoma. eMedicine [online], 2008. 5. Piette WW. The incidence of second malignancies in subsets of Kaposi’s sarcoma. J Am Acad Dermatol :16:855, 1987. 6. Safai B, Goo RA. Kaposi’s sarcoma: A review and recent developments. Cancer: 44:419-33. 1981. 7. Chang Y, Cesarman E, Pessin MS, et al. Identification of herpesvirus-like DNA sequences in AIDS-associated Kaposi’s sarcoma. Science 266: 1865-1869, 1994. 8. Brenner B, Rakowsky E, Katz A, Gutman H, et al. Tailoring treatment for classical Kaposi’s sarcoma: Comprehensive clinical guidelines. Int j Oncol: 14 (6), 1097-1102, 1999. This entry was posted in Uncategorized and tagged Classic KS, Kaposi's sarcoma, Metastasis, Pedunculated KS, Ulcerated KS, Uncategorized. Bookmark the permalink.